Using research from an innovative, cross-national project, this book answers fundamental questions about the nature of work in modern life. An important contribution to the global study of human development across the lifespan, this book contains a wealth of information and valuable instruments. DONALD E. SUPER was international coordinator of the Work Importance Study, based in the Department of Psychology at the University of Florida and professor emeritus of psychology and education at Teachers College, Columbia University. 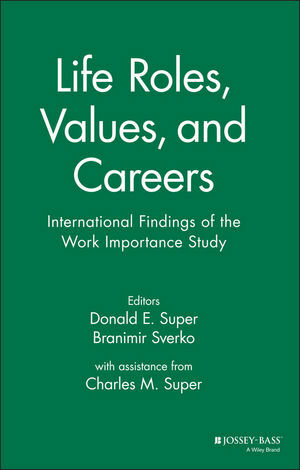 He was the author or coauthor of a number of books including Appraising Vocational Fitness, The Psychology of Careers, Computer-Assisted Counseling, Measuring Vocation Maturity, and Career Development in Britain. He died in June 1994. BRANIMIR SVERKO is professor of psychology at the University of Zagreb, Croatia, where he teaches work and organizational psychology and is currently directing the chair for Industrial Psychology and Ergonomics. "Offers a stimulating discussion around the questions of study.Professionals interested in career assessment, vocationalcounseling, personnel selection and program evaluation can benefitfrom the instrumentation yielded by this study."